None of these were a success, and all of them have been shut down. 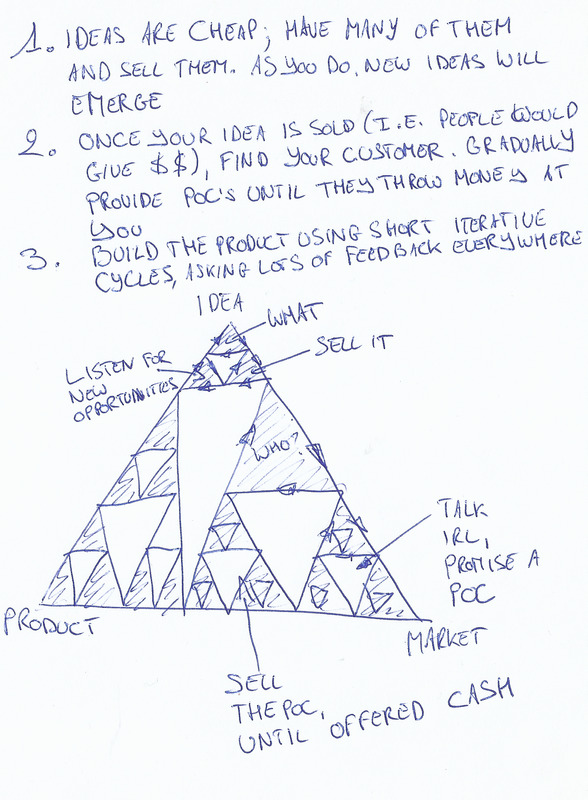 I never stopped thinking about start-ups, and had several ideas over the following years. Every time I had an idea, I tried to figure out an elevator pitch, and a complete story about it. I would then go around and talk to almost everybody about it using this story. If they were interested, I would tell them more and more and more. When we finally came to the price, I would ask them if they would pay for it. Most of the time the answer was something like “Can’t you put some advertisements on there, so I don’t have to pay?”. If I spent this much time on selling it, and they didn’t want to pay for it, how would I be able to convince others? Back to the drawing board. It was only after a while that I really learned to listen to the people I was talking to; I would then adjust my idea, pitch etcetera and try selling that. While this might seem really obvious now, I do realize it took me about 2 years to evolve from an idea that I assumed to be viable into an idea that was really viable. After some careful listening, I had finally found a problem where people would be willing to pay for the solution, but I had no clue on how to provide a solution. It took me another three months and endless discussions to figure out a market where I could actually provide a viable solution for this problem. I looked in my vast professional and personal network, and finally found a fit for a potential customer. I pitched the idea on a Friday night to this person, and he told me a person had contacted him for something similar, but that he never got any actual result. So I promised him to prep a rude demo, so he could have at least an idea what I was talking about. This talk took about 10 minutes tops. I spent most of the weekend and a whole Monday on building a POC that would show the essence of my idea using a very rudimentary approach. I sent the email on Monday evening (including the link) and by Tuesday noon, he knocked on my door. He explained what they were doing and what their utopian situation would be. Then he asked what my intent was. I gave away some pointers, not raising expectations too much, and asked for a meeting in his office in the next week, where I would elaborate on my ideas. This meeting took about half an hour. In the concept of under-promising and over-delivering, I spent over a week building a POC website. Every single day I had at least one person performing a usability test. Every single person was an acquaintance, and I just gave them the url, looked at their screen and said nothing. Users do not read sentences on the screen longer then a few words. Users should only be asked to do one thing, I separated a single step into 5 steps during the week. The thing you consider the key feature might not be noticed by your users, or easily forgotten. Adjust your user interface to make things more obvious. Simplify, optimize for the majority. (I.e. do not complect things, but use sensible defaults). I branded the product to my prospect’s site, and in the meeting I put a copy of their site with the link to my product on the big screen before we started. The prospect was over the moon, they wanted it yesterday, and they saw umphteen possible extension points. Then we talked about money: I told them I was in favour of no-cure/no-pay and that seemed to be a perfect fit. I am currently in the process of building the product, having very short iteration cycles, constantly publishing new versions, and looking for feedback from anyone I can get a hold of. I am not only asking feedback on usability, but also on my code from various persons. Talking to everyone about my product also allowed me to discover a lot of hidden value in my personal network, with tips which will probably help to alleviate the customer’s sales even more. As my income is based on a no-cure/no-pay model, I actually have the same goal as my customer: driving sales, so it is both in my and their benefit to optimize anywhere we can (which might even be after my client’s customer used my product). I will suggest them anything that will grow their conversion rate, even if it is not related to my product. The whole build-measure-learn thing should be recursively repeated ad libitum. Apply it everywhere!